Make your own "Happiness Jar." I am thirteen years old, blasting Taylor Swift in the background while scrolling through Pinterest to look for some DIY crafts to work on. Cringe? I know. As I scroll through my feed, I start saving a bunch of cute ideas I know I probably would not get to (in fact, I never looked at them again). Soon enough, something ended up catching my eye. Rather than finishing a small craft that day, I began a year-long project that I still incorporate in my life. Ever wish life were as simple as it was back then when you were a wee little toddler, not giving a single worry to the world? As a kid, I just worried about how I could get my mom's phone book down the toilet, how to erase all of my brother's English essays, and how much tighter I needed to grasp my dad's leg so he could carry me around as he walked. As we grow older, we actually need to become functional members of society. Our minds become more complex, and with that comes more problems we must solve, and more things to deal with. Sometimes, one small thing might end up setting us off for the rest of the day. Laying in bed at night becomes restless when we constantly have our minds running. Feeling down may cause us to lash out at others or go through what seems like a never-ending cycle of unhappiness. Every now and then, we'll go through a rough day, week, month, or year, it becomes easier for stress and worries to overwhelm us and sometimes it makes us forget about the great things that we have encountered. I think it's so extremely important for us to be reminded every now and then of the great things we have in our lives and remind ourselves over even the smallest things that make us happy rather than upset. But of course, it's always easier said than done. The post that caught my eye that summery day as a thirteen-year-old was similar to this one. The first thing I did was find a random jar (I found a clean fishbowl), decorated it a little, and it became my "Happiness Jar." 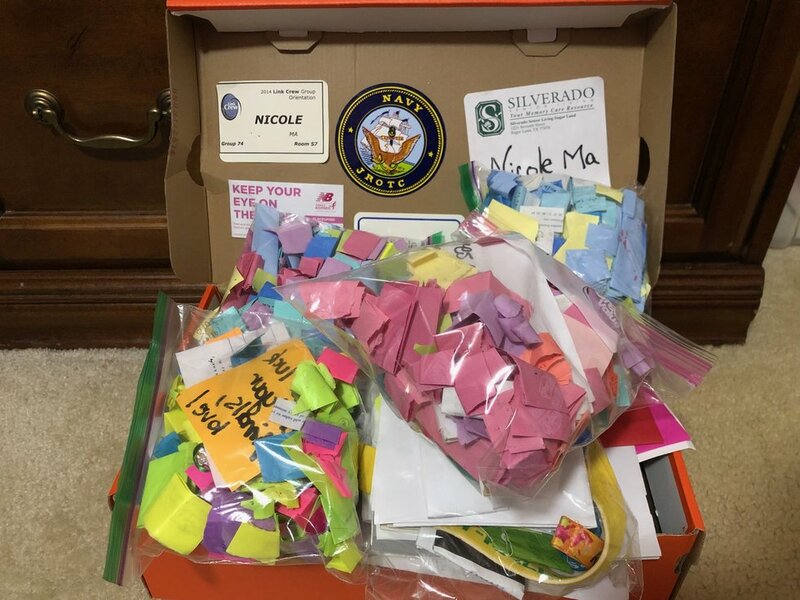 Day after day, I would rip off a small piece of a sticky note, date it, and write down the big or little event from that day that was memorable and made me happy. Then I'd fold it and pop it in the jar. It could have been that I was having a rough day and maybe a stranger smiled at me or held the door open, or it could have been finally heading off to college. Sometimes, I would write about amazing events that happened to my friends that made me super happy for them too. Whether it was from them earning a huge scholarship, or a friend having their first kiss, I would put it in the jar. When I felt down, I'd either think about something good about that day to write down or pull a random one out to read. At the end of each year, you could read all of them and reminisce over some fun or cringe-worthy moments before starting fresh. I usually take all of them and put them in a bag to store away so I can look back at it another time. Then, I begin again for the New Year. As bright and optimistic as I can be, sometimes I don't have the proper outlet if I may not be feeling the best. The happiness jar really isn't something that has to be super elaborate. At the age of thirteen, I started to mentally struggle significantly through my swimming career and a lot more personal problems. Swimming had been my happiness, my outlet… it was my lifestyle, so struggling with it created a whole new plethora of problems. 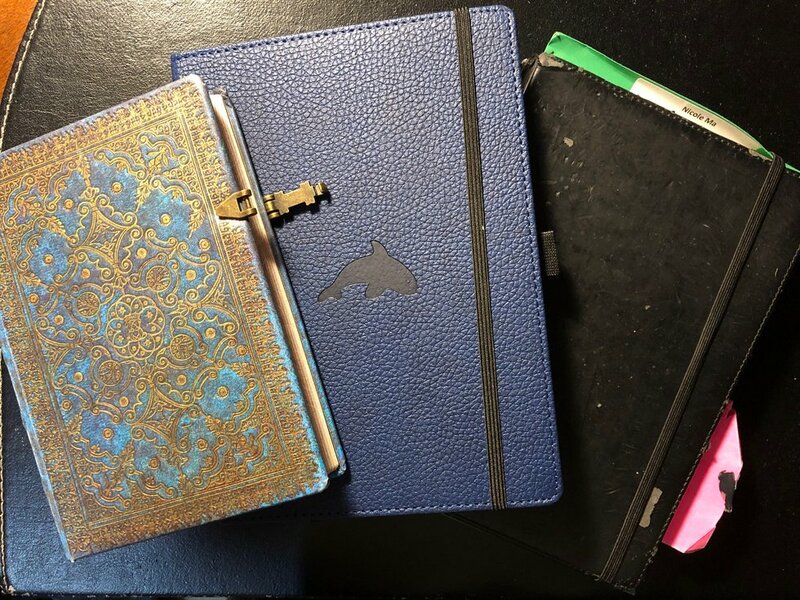 My coach at the time suggested that I begin journaling to keep track of my goals and progress. From there, I journaled about my swim meets, frustration, and it eventually turned into a personal therapy session with myself. Other people would call it a diary, but I mean… OK nevermind. Personally, if I have a problem; I like writing and organizing my thoughts to see if I can come up with a solution if I really didn't want to tell anyone about it. It's extremely therapeutic for me. Recently, I've fallen off track with journaling and my mind has felt so clustered with new information and changes, but I found that every time I do write, I feel better. It's as if I'm my own counselor. I write down what's on my mind, read it, and imagine if I were someone else and I work my way through my own advice. If I'm on the go, I like jotting down some of my thoughts on my notepad in my phone, or I write a reminder for something that made me smile to put in my jar at home. Whatever it was, I started making an effort in decluttering my mind onto something else. In a way, it's like taking a leaf blower in the fall to blow away all the dead leaves so I could see that the grass was greener on the other side. Sure, the wind blows every now and then, blowing the leaves onto your neighbor's yard, just like life, sometimes you'll just be naturally happy. Other times, you need that leaf blower cause there's no wind and these darn leaves. There are times when you have to take matters in your own hands. You have friends there for you, you can be your own therapist or counselor, and there are also actual therapies and counselors out there as well, which is an extremely useful and helpful resource out there. Whoever is reading this, as 2019 begins, I truly hope that your year is filled with so much happiness and growth. Know that when you're going through a rough time, you truly aren't alone. Remind yourself of the little things. Sometimes small, negative things can pile up and drag you down, but pile up the small and happy moments. Those moments are the most powerful. What I did was not necessarily a measurement of happiness. Some days I would forget to add to the jar, and that's OK. It was less about counting the moments that made me happy and more of making those happy moments count.